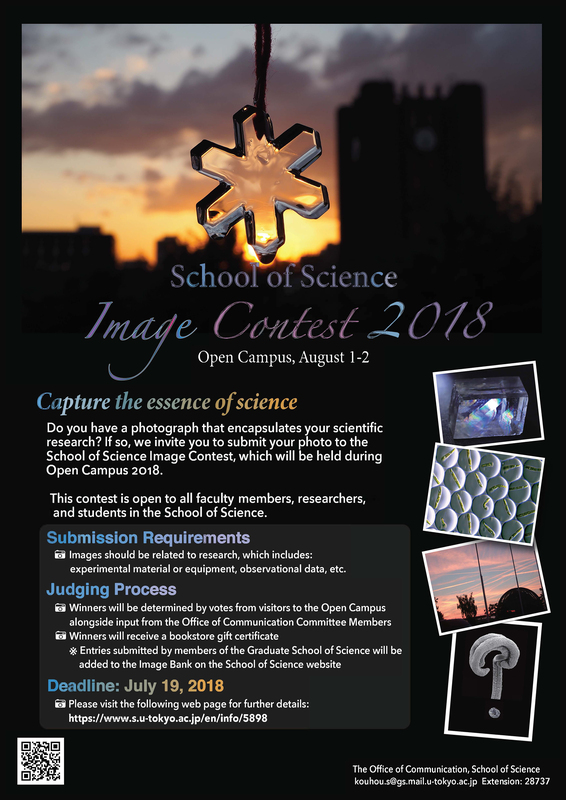 The School of Science invites all faculty, researchers, and students to submit outstanding photos of their research to the School of Science Image Contest, which will be held during the University of Tokyo Open Campus 2018. All entries will be displayed at the Open Campus 2018 event where visitors can vote for their favorite photo. Entrants with the most popular photo will be awarded a bookstore gift certificate. Photos should be related to research, which includes experimental material or equipment, observational data, etc. Please note that submitted photos should be authentic and not computer generated. ※Please note that we cannot accept any email attachments (e.g. Word documents, PDF or JPEG files, etc.) due to security concerns. You must be the sole copyright holder of your submitted photo. Winners will be determined based on votes from visitors to the Open Campus alongside input from the Office of Communication Committee Members. Winners will be awarded a 10,000 yen bookstore gift certificate and their photos will be temporarily displayed in the Science Gallery located in Area C, School of Science Building 1. Entries from members of the School of Science will also be added to the Image Bank on the School of Science website, with permission.